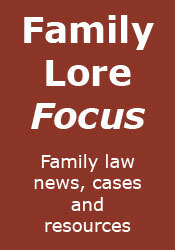 Family Lore: Should we send more child support evaders to prison? Should we send more child support evaders to prison? I posted last week about the high child support collection rate in Allegheny County, in the USA. It has since been pointed out to me that with a case load of 46,500 Allegheny County sent 345 people to jail last year for failure to pay, whereas over here the CSA has a case load of 1.2 million and only 40 people were jailed. This begs the question: should we send more child support evaders to jail, to increase the collection rate? A more sensible way to pose the question would, of course, be: would the collection rate improve significantly if more evaders went to prison, and therefore the chance of a prison sentence for evasion were higher? The law on commitment to prison for failure to pay child support is contained in ss.39A and 40 of the Child Support Act 1991. Essentially, the CSA may, as a last resort, apply for a warrant of commitment and, if it finds that there has been 'wilful refusal or culpable neglect' to pay on the part of the liable person then the court may commit them to prison for up to six weeks. The prison sentence can be imposed immediately or suspended on terms, for example that the liable person pays the amount due in fixed instalments (745 suspended committal sentences were imposed last year). If the liable person is sent to prison, they will be released upon payment of the amount due, unless they are in custody for some other reason. The whole idea behind this post presupposes that a greater risk of prison equates to more people paying, but I'm not convinced. Obviously, there will be a few who are prepared to go to prison for a principle, or for whom prison is simply no deterrent. Leaving those few aside, how many of the rest are prepared to take the risk of a prison sentence, just because the chances of getting one are low? My feeling is that for most of those people the threat of prison, no matter how unlikely, would be enough to 'concentrate the mind' and persuade them to pay. After all, it is common knowledge that non-payment can result in prison, but the statistics for how many are sent to prison, although freely available (see below), are almost certainly not common knowledge. So, is there any statistical correlation between between numbers sent to prison and collection rates? I'm not aware of any, and the CSA enforcement figures for the financial years from 2004 to 2010 (see here, p.23) do not suggest any such correlation - the number of committal sentences has remained very low, whilst the total collections received have steadily increased. Going back to the American example, I suspect that the numbers sent to prison are consistently much higher across that country than they are here, and yet their overall compliance rates appear to be similar to ours (the article in the Pittsburgh Tribune-Review quoted sample rates of between 66 and 80 percent for 'on-time payments', whereas the CSA's latest figure for '% cases with a positive outcome', albeit using a slightly different criteria, is 77% - see here, p.17). My answer to the original question, therefore, would be 'no'. In any event, as has also been pointed out to me (and as was my view anyway), this is not a criminal matter, and surely it is in everyone's interests, particularly the children concerned, that the parent is out and working to pay off their arrears, rather than languishing at Her Majesty's pleasure? I agree up to a point. I'm certainly not convinced that imprisoning child support evaders is a good use of the proson system, any more than imprisoning those who refuse to comply with contact orders is. A better way to encourage payment is to look at systems in which liable parents pay willingly rather than simply because the state has them in an arm lock. Areas to look at are fairness; ensuring the money goes to the child; ensuring that contact is taking place; etc. Child support subsidises family breakdown. Expecting a parent to pay is an expectation that they will cooperate in the destruction of their family and in their removal from their children's lives. It is hardly surprising that parents can be reluctant to pay, and the task of a civilised system is surely to enable them to be involved, hands-on parents, and not ATM machines on legs. Fairness: I agree that the amount that the NRP should be fair, and that this may not always be the case under the present system. Ensuring the money goes to the child: Difficult, unless you specify that the NRP pays for certain items, which would not be easy to track. In any event, I'm not sure that this is that big a problem - the vast majority of PWCs properly support their children, and the child support contributes to that expense. Ensuring that contact is taking place: This is once again mixing two separate issues: whether contact takes place depends upon what is best for the welfare of the child, not whether or how much the NRP is paying. With respect, if someone takes the view that "child support subsidises family breakdown", or that "expecting a parent to pay is an expectation that they will cooperate in the destruction of their family and in their removal from their children's lives", then it is hardly surprising that they will be reluctant to pay. I would suggest that if the CSA managed to get their assessments correct on each and every occassion, then there may be a case for sending defaulters to prison. But the present system is fundamentally flawed and unfair, has no regard to personal circumstances, and uses a irrational formula that imprisonment would simply add to the injustice. If a NRP challenges a liability order, the Courts are not able to consider whether the calculations are correct. Yet the NRP is usually unwilling to pay because the calculation is not correct. It needs a fairer system than the current one, and if it was fair, I would imagine a lot more NRP's would be more willing to pay up, threats or no threats. yeah - bang em up! they aren't dangerous, they aren't indulging in a pattern of behaviour from which society needs protection and the agency giving us the info is totally reliable. also we need more people on really short prison sentences cos it's such a bargain.